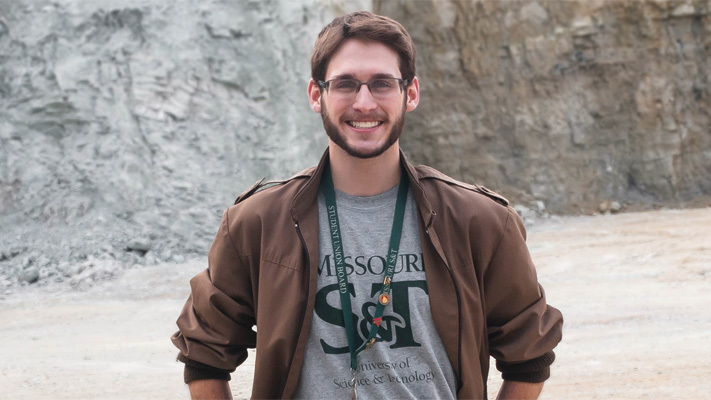 A self-proclaimed “band geek,” he chose Missouri S&T because he immediately fit in. Bouchard loves the variety of opportunities available to him at Missouri S&T. He plays trumpet in the marching band and is active in Fencing Club and National Residence Hall Honorary, among others. Last year, he played Charlie Bucket in the S&T theater production Willy Wonka. He is one class away from completing a minor in Russian. Bouchard works with John Hogan, associate professor of geological sciences and engineering, to research the mysteries of bizarre dome-like structures in Egypt’s Afar Desert using satellite imagery. Called “desert eyes,” these structures make the terrain look like bubble wrap, he says. Bouchard’s love of space fits into his plan in other ways, too. Hanging on Bouchard’s wall is a 176-goal flow chart he hopes will lead the Mars Rover Design Team to success. Bouchard is CEO of the group he co-founded with 15 friends last fall. The team — the newest group to be included in the Student Design and Experiential Learning Center — is designing and building a remote-controlled vehicle capable of traversing the red, rocky terrain of Mars. The team will take part in a summer 2013 competition sponsored by The Mars Society. This summer, he is applying his knowledge and experience at an internship with Johnson Space Center in Houston. He’ll be working for NASA advisors in conjunction with the Lunar and Planetary Institute on prototype rover development and testing — work that’s right up his alley. Ultimately, Bouchard wants to be an astronaut. Until then, he plans to spend four years in college, five years working in the field of exploration geology and six years working on a Ph.D. in planetary geology — the study of other planets. But if things don’t work out the way he plans, he’s all right with that, too. In fact, he’s on version 12 of his four-year college course plan. A version of this story originally appeared in Missouri S&T Magazine. Read additional stories from the Spring 2013 issue. You rock, Michael! It is priviledge to be your professor! Outcomes of Missouri S&T always are the best, smart students and a high level of academic staff. You’re such a stud, Michael!